For myself as a student of physics, and likely with many professional scientists in the 20th Century, there was a lingering empty feeling from this type of “pull-it-out-of-the-air” proclamation for something fundamental to so many calculations and theories describing how Nature works. The speed of light, c, is a fundamental number that is directly measurable (try it yourself with chocolate), the definition of a unit of time in seconds, s, is directly measured from a naturally occurring phenomenon with unprecedented regularity (originally based on the rotation of the Earth, with all of its wobbles; now on the energy level transition in an atom near absolute zero temperature), and the meter is marked off (since 1983) by a measurable distance traveled by light in a fraction of a second. So, most other important units are built up from more fundamental definitions. Yet, the kilogram, with its smooth lump of metal, is still thrown into this fundamental mix. For example, the Newton, N, is a unit of force measured from the well-loved equation F = ma, and carries the units of kilogram · meters per unit second. If the value of one kilogram was set only as the collective whim of humanity well over one hundred years ago, then what does that say about every calculation of force since that time? Well, probably not much, since we’ve been working just fine with it ever since. If the fundamental value changes, it just scales all other values with it. 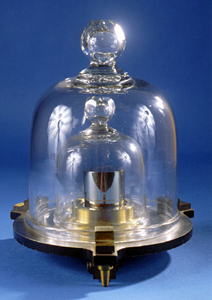 However, it might just be nice, or more reasonable, or more scientific to have the value of the kilogram defined from other measurable fundamental values so it may never be questioned or changed (or stolen for a private collection, or fall through a crevice in the Earth after a quake never to be found again). The mission of cleaning up the fundamental definition of the kilogram has been underway for many years with an international resolution declared in 1999, at the turn of the century. Now, this latest collective whim of scientists is to derive the value of the kilogram from a very fundamental number found in the realm of quantum mechanics, called Planck’s constant, h.
First described during the turn of the previous century, in 1900, by Max Planck, this constant represents the ratio of the energy (E) of an atomically-small oscillating object to its frequency (f) of vibration. The relationship, called the Planck-Einstein relation, E = hf, became a basic underpin to the development of quantum mechanics. The proportionality constant h made an appearance in a plethora of key equations that came to describe the Universe at its tiniest scales, including the counter-intuitive notion that very small things can behave like a wiggling wave and a bouncing particle simultaneously. The actual value of the Planck constant is likewise incredibly tiny, measuring in at only 6.626 x 10-34 Joules · seconds. So, to define something else directly from a measurement of this value, insane accuracy is required. This is where the expertise of the National Institute of Standards and Technology (NIST) became a valuable player in establishing the new life of the kilogram. The advanced measurement technology at NIST to be used for the kilogram is called a watt balance and is a modern-day extension of the classic equal arm balance dating back to at least the second century BC. Since it was originally conceived, an unknown mass is visually balanced by placing a collection of known masses on the opposite side of the device. When the two sides are resting at an equal height — i.e., the same force due to gravity, F = mg, is acting on each tray — then it can be assumed that the unknown mass equals the known mass. This millennial-old approach may have even coaxed the human drive to base any definition of mass from a known sample leading to the double-bell jar and platinum cylinder we find locked away today in a suburb of Paris. The watt balance sets up a similar arrangement using a comparison of forces. This time, instead of watching gravity do its thing, the device measures electrical and mechanical power, hence the name “watt balance” where watt is the unit of measurement for power (as in 1.21 gigawatts… Great Scott!). Here, a highly controllable measurement of a force resulting from electromagnetism balances the gravitational force on the unknown mass. Flowing a current of electrons through a coil of wire inside a magnetic field on one side of the watt balance will create a force, and if aligned appropriately, this force will shift the two sides into balance for a particular current providing this electrical power. This initial measurement provides a value of the unknown object’s mass in terms of a current, the magnetic field and the physical dimension of the coil. However, we are looking for more: a direct relationship with the tiny and fundamental value of Planck’s constant. So, a second measurement is taken on the exact same setup of coil, alignment, and magnetic field to determine the voltage generated in the circuit when the coil moves through the magnetic field. This is the mechanical power generated during the balancing experiment. Historically, this mathematics and experiment on the watt balance has been used with a known mass to accurately calculate the value of h. Flipping the same equation on its head, if a “known” value of h is instead plugged in, then a value for the “unknown” mass, m, may be calculated. And just with that one mathematical flip, we now have a fundamental definition of the kilogram based on Nature with quantum mechanics being used to describe a macroscopic quantity. NIST has been building and operating watt balances since the early 1980s in order to nail down our “known” value of h. The latest generation, dubbed NIST-4, began operation in 2015 with specialty modifications to become an international standard for measuring mass. To be a standard, ultimate precision is the goal and NIST-4 is working to master its measurements with an uncertainty to 0.00000003. The international scientific community is serious about this new definition and there is a deadline to complete all of this work. In late 2014, the International Committee for Weights and Measures (CIPM) established a roadmap of effort toward officially agreeing on the new definition of mass. This plan includes consistent measurements of the Planck constant to within 0.00000005 — placing NIST’s goal into comfortable territory. The end of the road will occur at the 26th Meeting of the General Conference on Weights and Measures (CGPM) in 2018 during which the new unit of mass is expected to be adopted. This level of extreme accuracy should certainly be left to the extreme scientific national labs such as NIST. However, the foundational idea behind the balance is still one that has been around for centuries. It is with the advancement of our appreciation of the quantum world that we now have mathematics that can relate this type of measurement with one of the most fundamental values representing our Universe, Planck’s constant, h.
So, what if we could now measure — with reasonably good accuracy — h at home? You can … just try building it with LEGO®. The same team working on the NIST-4 developed a recipe for designing and building an at-home version of the watt balance. For around $400 and with 0.01 (1%) accuracy, masses may be measured at home by using the same technical concept NIST will use in 2018 to provide internationally accepted scientific measurements of the kilogram. The shopping list includes LEGO® (of course), copper wire, off-the-self laser pointers, free data acquisition software, a data acquisition interface (this is the major expense–but you will open up to an enormous new world of experimental opportunities at home! ), several permanent magnets, and lots of building and testing fun with the family. While this might seem a bit over-the-top for an at-home utility, the same device can also take a known value of a mass and measure the fundamental value of Planck’s constant. Tiny physics with big ideas right in your own basement or garage. Now that the idea of building with LEGO® while doing some excellent experimental physics has you ready to jump right in to start ordering parts, you might first get way more in-depth with the NIST efforts to develop the new standard for the kilogram (download article*). Then, go ahead and dive into the instructions for building it all at home, which is included below for your immediate reference.